It’s an understatement to say that Rustin Cohle is intense. The “tax man” sets himself apart from the norm and doesn’t shy away from speaking hard truths. Only Cohle would shut down his friend Hart’s emotional outpouring to him about his failing marriage with “It’s none of my business.” But Cohle speaks out often and loudly not because he is a gadfly or a narcissist, but because he is trying to be authentic. In True Detective, we watch him evolve from a man who is slowly suffocating under the weight of the world to one who can shoulder it. His metamorphosis is existential, and by the end of the series, Cohle has arrived when he proclaims that the “light is winning” (Episode 8). Cohle is a man in the throes of an existential crisis. Existentialism is a school of philosophy that is best summed up by the oft repeated phrase “existence precedes essence.” Some of the more well-known existentialists, such as Friedrich Nietzsche and Jean-Paul Sartre, reject the idea that anything metaphysical—like God—created humans to be one way or another. In fact, for these thinkers, God does not exist at all. For many existentialists, to reject metaphysics is to reject that we are born with a core self, an essence, or a set purpose. Cohle rejects the existence of God often and loudly with dismissive comments that cast religious people as having a “propensity for fairy tales” (Episode 2). Both Nietzsche and Sartre describe the dread and anxiety that results from rejecting the existence of God. For existentialists, the knowledge that we create our own meaning is, initially, an enormous burden. Sartre believes that it will be paralyzing before it can be recast as liberating, and Nietzsche describes it as deadening and dulling to us before it can make us creative and alive. It is harsh to realize that we must create meaning out of nothing, with no God to approve of our actions, and nowhere to go when we die. Most of us choose to ignore it, or retreat into a position of inauthenticity, or deny our existential freedom. To live authentically would be to overcome the dread created by a world without God and to live with a self-designed purpose. Cohle agrees with Nietzsche and Sartre that God does not exist, but he embraces his dread rather than his freedom. This leads him to say things like, “I think human consciousness is a tragic misstep in evolution… we are things that labor under the illusion of having a self… the honorable thing for our species to do is to deny our programming… stop reproducing” (Episode 1). Cohle is paralyzed, pessimistic, and misanthropic. In Thus Spoke Zarathustra, Nietzsche provides us with an image that captures the thread of Cohle’s oppressive narrative about himself. Nietzsche describes a tightrope walker who must go from point A to point B on a tightrope; along the way, he has to jump over a person (“the spirit of gravity”) who taunts him with poisonous comments and fills him with doubt. It is an image about the hard road we travel from the rejection of God (point A) through the overwhelming dread that ensues (the person on the tightrope who hopes to make you fall to your death) to the intentional creation of meaning in the face of such nothingness (point B). Cohle is balanced on the tightrope, and he is sick with poison. Yet Cohle’s actions belie his proclamations about the futility of existence, for Cohle’s obsession with the Dora Lange case is not just about trying to catch a killer. He is trying to understand an uglier, darker, and crueler kind of killing—that of vulnerable women and children. And Cohle is obsessed. Years after Cohle and Hart locate Reggie LeDoux and “solve” the case, Cohle learns that the case is bigger than LeDoux. He starts investigating again in spite of direct orders from his superiors telling him to desist. When Major Salter demands an explanation for Cohle’s obstinate behavior, Cohle says “Women, children disappearing. Nobody hears about… Nobody puts it together… Women and children… neither get no press” (Episode 6). Cohle wouldn’t risk career and life to continue the investigation if he really believed we are just “biological puppets” (Episode 3). Enter Nietzsche’s eternal return as a framework for Cohle’s struggles. For Nietzsche, you cannot truly love life unless you can see it for what it really is and still love it. In fact, you have to love life so much that you will it eternally, in all of its sheer beauty and utter horror. Nietzsche uses the imagery of peaks, valleys, and abysses to describe the spectrum of life, which contains both intense joy and unbearable suffering. For Nietzsche, you have to confront the low points, or abysses, in life and not let them consume you. In fact, you have to will both joy and suffering eternally. Of course this does not mean that you condone atrocities, but that you find a way to live and love life alongside a real knowledge of the utter savagery that happens (intentional or natural). Nietzsche calls it his most difficult thought, and Cohle is in its throes. The “spirit of gravity” is a name for what holds the existentialist in a state of defeat and anxiety in the absence of God: it is the enemy on the tightrope. Reggie LeDoux is an apt embodiment of this spirit. When Cole describes how he imagines that a person on the brink of death welcomes death, he says that he or she understands in that moment that life is a dream, “a dream about being a person ,” but that, “like a lot of dreams, it had a monster at the end of it” (Episode 3). As he says this line, we are shown an image of LeDoux wearing a gas mask, carrying a machete. And while LeDoux is a picture of the alienation and raw violence that would drag anyone into doubt about human nature, Cohle has more monsters to meet before he confronts his own dread. Nietzsche gives us an image of the eternal return in Thus Spoke Zarathustra that fits Cohle’s existential struggle. In “On the Vision and the Riddle,” Zarathustra describes a shepherd who, while asleep, had a snake crawl into his throat, bite him, and hold him tight. The shepherd can either choke on the snake or bite its head off. Zarathustra describes the choking man’s face as filled with utter horror—he is suffocating and gagging. Zarathustra tries to help but realizes that only the shepherd can help himself. Zarathustra tells him to bite the snake in half. The shepherd does it and stands up, as Zarathustra describes, transformed and laughing. The snake represents the necessity of affirming all aspects of life and willing them eternally. Who would not be sickened and choked by the thought of affirming all the suffering in life along with all the joy? When the shepherd bites the snake, he has become strong enough for that kind of affirmation. He doesn’t condone suffering, but he can shoulder it because of his profound love for life itself. Throughout True Detective, Cohle is the shepherd who is choking on all that is bitter and ugly in the world. He is struggling to find the strength to kill the snake. This leads us to Errol Childress. He is the hyperbolic monster at the end of the dream. He is the spectre of nihilism and suffering. Cohle has been staring into the abyss of human suffering for decades, but when he goes to Carcosa, he falls deep within it. And Childress waits for him at the bottom. Their battle ends with a violent, crippling battle and Childress’s death. But Cohle’s story doesn’t end there. Cohle and Hart know that Childress was not a lone wolf. 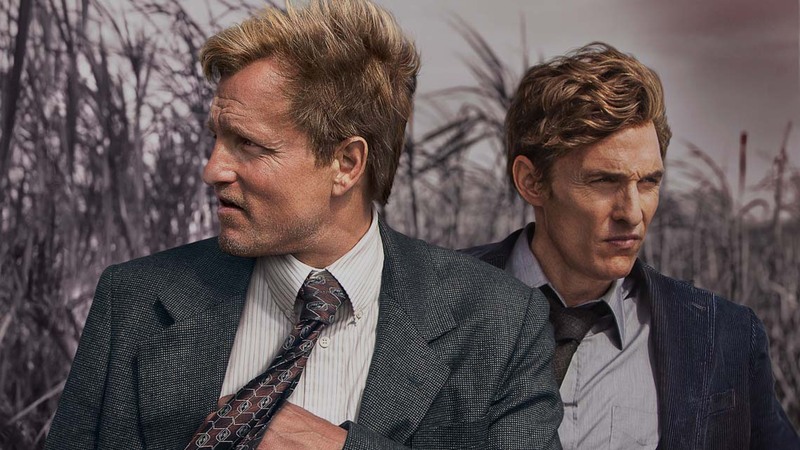 They have proof that the Tuttle family is linked to the murders, but the family’s power actively erases any connections that Cohle and Hart were able to draw. Like any truly frightening monster, this one cannot be killed—Childress was just one of its many heads. The circle of violence and destruction is not broken by Childress’s death. As Cohle says to Marty from his hospital bed, “We didn’t get ‘em all” (Episode 8). In the face of this, we expect Cohle’s despair to deepen, but it doesn’t. In fact, Cohle discovered more than just a monster at the bottom of the abyss. In the final scene of the series, Cohle and Hart have a cryptic conversation that is couched in terms of the battle between light and dark. Cohle is still reeling from his near death experience in which he was immersed in “the dark” and could feel the presence and love of his deceased daughter and father. He says that “I was a part of everything that I ever loved. And we were all, the three of us, just, just fading out. And all I had to do was let go… and I did… And I disappeared. But I could still feel her love there. Even more than before. Nothing… nothing but that love. And then I woke up” (Episode 8). While he had earlier proclaimed that death confirms the futility of existence, he discovers now that he was wrong. Cohle travelled deep within the abyss of human misery and suffering and he found, at the end, not only a monster, but pure love as well. In fact, it was the monster that led him to the feeling of love. In that moment, he finally “lets go” and “bites the head off of the snake.” The circle is complete as he has found the joy in the suffering of the abyss. While he finds his meaning and begins a new narrative, it is not based in God or the afterlife. It is grounded in the memory of the genuine love that he once felt with his daughter. He now believes that there is real love amidst suffering, and that even in the darkest night there are stars. The final lines of dialogue crystallize his new, existential optimism. Looking at the stars in the dark sky, Hart says, “Well, I know we ain’t in Alaska, but it appears to me that the dark has a lot more territory.” Cohle thinks about this and says, “You lookin’ at it wrong—the sky, I mean. Once there was only dark. If you ask me, the light’s winning” (Episode 8). In this moment, Cohle jumps over the spirit of gravity, and finds solid ground on the other side of the tightrope. Sarah K. Donovan is an associate professor in the Department of Philosophy and Religious Studies at Wagner College in New York City. Her teaching and research interests include feminist, social, moral, and Continental philosophy. She has published on topics as diverse as a contemporary reading of Benedict Spinoza and teaching philosophy outside of the classroom. She has also coauthored several chapters for various books in the Blackwell Philosophy and Pop Culture Series. This is a really great piece of writing. Really enjoyed reading this, thanks for this. That was wonderful. Thanks for making people comprehend this story. thanks. this actually shed a lot of light on my own personal struggle after loss. Nothing new to add here, but I sum myself to the general Thank You for this reading. I just wanted to say that piece was deeply meaningful to me personally. You brought together a lot of disparate thoughts I have been having due to my deep dive into TD season 1 (I just now watched it, I didn’t when it came out years ago, I’m not much for TV or movies). It has led to A LOT of reading and thinking, it is just an incredible and thought provoking series. Your connection with Zarathustra and the snake really struck home and cleared things up for me. Thank you.